For many years Australia has been labeled a hotbed of Internet piracy. Faced with high prices, a dearth of choice, and legal products arriving months after their debut elsewhere, millions of Aussies have turned unofficial sources. 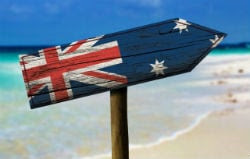 As a result, Australia has found itself in the spotlight of both local and international rightsholders who claim that their industry is hemorrhaging millions due to people downloading via torrent, streaming and other file-sharing services. While the latter mechanisms are more difficult to police, those obtaining media via torrents are relatively easy to track so with this in mind, rightsholders have been placing local Internet service providers under pressure to cooperate in a so-called three-strikes anti-piracy scheme. In the early days cooperation was not forthcoming so in order to force compliance, movie companies decided to sue ISP iiNet. That action failed in 2012, leaving entertainment companies to re-build bridges and deal with matters on a friendly basis. Years of on/off negotiations ensued, more recently with government involvement. Late last year it looked almost certain that a “three strikes” style scheme would be implemented, with pirates being monitored by copyright holders and notified of their behavior via escalating ISP warning notices, with legal action being the final step. But earlier this year it was revealed the whole project was in peril, entirely on the issue of costs. Now it’s been officially confirmed that the project has been shelved. In a joint letter to the Australian Media and Communications Authority, the Communications Alliance and Foxtel (on behalf of rightsholders) state that it had “not proved possible to reach agreement on how to apportion all of the costs” for the scheme. In all the years of intermittent discussion on “three strikes” costs have always been an issue. Agreement has been reached in other regions, the US for example, but Australia appears to have a unique set of problems. These costs are reportedly associated with preparing the notices, contacting alleged pirates and dealing with the inevitable flood of telephone calls from unhappy customers. These type of costs are entirely associated with actions the ISPs would be required to carry out themselves, which suggests that the providers have continued to stand their ground, much as they have for many years. Earlier this year Village Roadshow co-chief Graham Burke bemoaned the manual warning system under discussion, complaining that the labor-intense mechanism would churn out notices at a cost of $16 to $20 each. “You might as well give people a DVD,” he said. But even with automation the ISPs are predicting extremely high costs. So what now for the Aussie downloading problem? Well, it appears that for at least a year not much will happen. With copyright trolls seemingly running for the hills it will be up to legal alternatives to try and persuade consumers they’re a more attractive proposition. They won’t have to go that alone, however. “We are going to be mounting a massive campaign to reinforce the fact (to the public) that piracy is not a victimless crime and we have to continue to provide content in a timely way and at affordable prices,” Graham Burke said. And of course the specter of site blocking is still on the horizon and possibly just months away. The music industry may have temporarily suspended its case against KickassTorrents but other cases involving The Pirate Bay are running full steam ahead and will almost certainly conclude before the end of the year. The Kickass case will conclude shortly after. As for three-strikes, that will be subject to a review in April 2017 but given that agreement over costs hasn’t been reached in close to a decade, another year seems unlikely to make much of a difference. good i hope the aussies don't use that stupid policy i know we don't need it. you know Disney made over 7 billion bucks in movies last year read that again? 7 billion bucks they aren't hurting for money and that's for movies alone. the figure is no doubt bigger than that since i read that awhile back. but you can be damn sure that i'd say 50 or more than 50% of it is because of piracy. i have no proof of that of course or a link just an opinion. now you take piracy away and it would NOT surprise me at all if that number of how much money they made dropped drastically. they need to understand that NOT everyone who downloads. i've said it a billion times on the net through the years. the new ghostbusters film i may download it just because i'm curious to see it. not because the film looks any good in fact i think it looks like utter garbage and it's not because of it's cast either. i guess there's a LOT of man hating humor in it and a lot of fart jokes. and crap like that how is that stuff still funny? you know how they get rid of the bad guy in the film ? they shoot him in the balls! SERIOUSLY how is this in a ghostbusters film? just because it's women that do it that's why. and there's plenty of funny women out there and plenty of writers that can do it well but this is one that just doesn't look good. my point? i have no desire to ever pay to see it because of my views on the film. the idea of having to say the original series makes me want to vomit in my mouth because on how such a bad idea it was to make that film. so they will never see my money even if i never download the film or just stream it.